Spray size (not starch) will make a huge difference in your quilting. Before, I used sizing, my quilt blocks would always come out small. This was not due to my 1/4″ seam, it was a scant and not a true 1/4″. I no longer wash my fabrics. I think companies have figured the bleeding out, but I also do not do anything using white or really light fabrics, so i am safe…if I for some reason would I use white I would test the fabrics. Now because I don’t pre wash and I use lots of fabrics form different companies, what was happening is, while piecing my blocks, my fabrics were shrinking because I use lots of steam when I press them. They shrink ever so little but by the time your block is together you have lost 1/4 to 1/2″ on your blocks. So how does the size come in?…BEFORE you do any cutting. Spray size your fabric, spray it good and then iron it dry. This helps pre-shrink your fabric NOW before you cut your strips or pieces. Now you have it all shrunk up, you have added more size to the fabric, it will now cut and piece nicely and your blocks will be the right size ! Then here’s the added bonus….I have always envied my friend Carole’s quilt tops, They are perfect and crisp and they do not have all those little strings on the back…the SIZE also helps with that too! Now you can buy Magic Size at many places in the laundry detergent isle…and then run to your local hardware store and buy some handles and spray that fabric! Ohhh I would love to try this one!! I do not have a pattern for the strawberry pin keeps…I bought a bunch of them on EBAY from a wonderful wool artist…Susie-everything she makes is awesome! Kim will be lucky to own one of her treasures! I’ve used the sizing when I do the 9-patches your way, and it really does work! Beautifully accurate blocks! Great tip–I have a problem with some fabrics shrinking more than others. I will be trying this out, for sure! Will look for the sizing, another good tip..Maybe you have found another outlet besides quilting. lol…and what would that be Shirley? Good idea on the sizing. I keep it in my sewing room but don’t use it because it comes out too heavy. Now, I’ll get the spray nozzle like you say. Added bonus for me is the little fraying threads on the back of the quilt going away! OK Lisa, you always seem to amaze me. I have never seen those handles!! I will be getting one soon. I’ve been using the Best Press spray..how does it compare? I LOVE Magic Sizing. It is the first thing my mom taught me about for quilting….spray that fabric well….now I will have to get a handle…so after work I will be off to the local Ace Hardware. The sizeing soundes like a very good idea. I will have to try it. I have preshrunk by spraying with water and ironing but haven’t tried this product. Thanks for the tip. I’ve bought the sizing, but forget to use it. I have a project coming up that I will be sure to try it on and should be able to pick up a handle before then. Thanks Lisa, for the great tips. OMG that makes so much sense! I have just stopped using steam but not for the reason of shrinkage. My iron just got yucky from the calcium and mineral deposits so I bought some sizing, I’ll have to run down the street from work to get a handle, and maybe an extra for my quilty friend’s Christmas gift basket. I use both but didn’t know about the spray handles, cute idea. Always look foward to the next idea. I love the idea of the spray handle. Didn’t even know it exsisted! I am going to get one, as the spray from the can does clump (or get heavy spots) and it really helps in quilting. Thanks for the hint. Great idea of using the spray handle. I too do not wash ahead but have been using sizing. It does make a difference. Thanks again for the tips and a chance to win. What a great idea, I certainly will give it a try! OMG! Thank you for this information!!!! Wow! I had no idea! I need some of this. Wonderful! I will have to try this starch. I’ve always used best press. Thanks for the tip! I am going to get some today. Thanks! I have never used this product, but will definitely have to try it. I’ve been having problems with my blocks being short on one side. If the block is supposed to be be 6 1/2 mine will be 6 1/2 on one side and 6 1/4 on the other. I always thought it was my piecing, and it may be…or not! Great tip. I was spraying my blocks AFTER I sewed them! Been a starch user and knew it helped with cutting and piecing. Didn’t even think about the shrinking part. But will definitely be off to the hardware department for one of these spray handles. 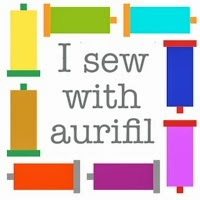 This is a great tool for turned applique too! I’ve started using it…it does make a difference! Merry Christmas! I have been sizing everything for awhile now. Didn’t know those spray handles existed! That would be much easier to use with the carpal tunnel!!!! Thanks for the tip, Lisa. I will get some sizing (and a handle, too) before I cut out my next project. This is a great hint! I had no idea. Thanks so much for all these useful tips. I love the idea of using the spray handle! Thanks for all your tips. Is there a difference between Best Press and Magic Size? My blocks ALWAYS end up around 1/2 smaller and I’ve done everything I can think of without any luck! My cutting is exact, as is my piecing – drives me nuts!! I will be trying this and am keeping my fingers crossed. Thanks so very much for sharing this! I will be doing backflips if it solves the “shrinking” blocks! You have the best ideas, too bad there are only 12 days of Christmas tips. How about extending your great ideas into New Year’s resolutions?? Never thought of this, will have to give it a try. I have never heard of this product before. Thanks for all the great things you are showing us. Hmmmmmmm. I’ve been spraying AFTER I cut. Next time I’ll get it right. Thank you! Another great tip! I’m just loving all these tips! Now why didn’t I think of this..I keep the big W bought out of spray sizing ever since I bought your little nine patch book. Thanks to you I use Magic Sizing all the time and I will surely get one of the sprayer nozzles! I have been prewashing AND starching for the last few years and my blocks are so much more reliable but I would like the time saving aspect of skipping the wash and just sizing and pressing. Thanks for the tip! I will have to check it out. My blocks are never the size they are supposed to be. Maybe this will help. Great idea to use a handle. Time to go shopping. Question: do you dry iron or use steam with the sizing? Ohhh , Thank you so much for this tip! Actually the best tip ever! I have this sizing and I always use it for just plain old ironing! Now I need to hit the hardware store for the spay handle. Thanks again for this terrific tip! My quilt squares will now be so much better! Lisa thanks for the great tip, I also have a problem with my quilt blocks not coming out the the perfect size, i=I’m going to give this a try to see if it helps with my problem. Thanks again and Have a Merry Christmas. Love your shop wish it was closer for me. Going to get this right now! I have been using sizing for quite a while now and it really does help. Now I need to go to the hardware store for the spray attachment. Do you totally saturate your fabric? I always seem to shrink my square as I am working with it. I don’t wash my fabrics nor do I use steam…until I get to the end. And then it seems my nicely built block is smaller by an eighth of an inch. Thanks for this tip. Great tip. It makes sense, especially if you have lots of tine pieces in your block. Thanks for sharing. I didn’t realize that spray sizing would also help by pre-shrinking your fabric. Great idea, thanks. what a great idea! if i use precuts, i worry about shrinkage … this would be a big help! I’m putting it on my grocery list now! What a great idea – using the handle! Will make it so much easier. what’s the difference between sizing, starch and best press? Love your idea. I use Magic Size too but never thought about the spray handle.. love that idea.. Thanks…. I have seen this on your blog in the past, I love this stuff, a cheap and easy way for better piecing. Thanks for sharing this! I seem to always have slightly small blocks, and like you I sew a very scant 1/4″ seam, but I press the dickens out of it, so now I know! I will definitely give this a try. I am going to buying a truck load of Sizing when I find it!! thanks for all these wonderful tips! I have been using the sizing for a while, especially on fat quarters. It gets those nasty fold wrinkles out too! Love the handles!! 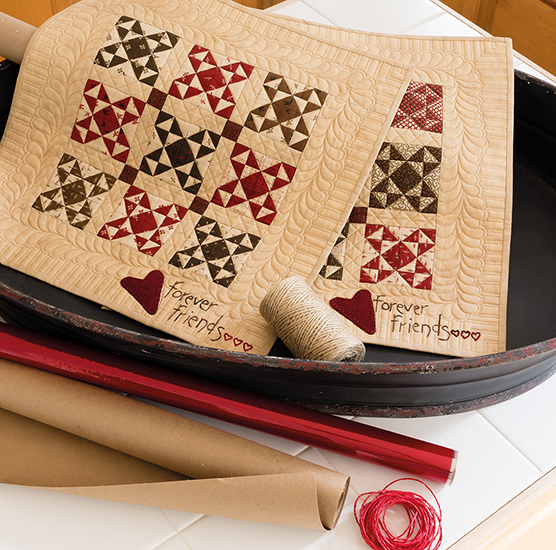 Isn’t it amazing what you can find at the hardware store to help with quilting? Thank-you for all the great ideas. I will definitely try the sizing. I too iron with a lot of steam. This solution makes sense. Very interesting. I am a either a Best Press or Magic Sizing user but I have never thought about using the handle. Great idea. I don´t prewash my fabrics.I spray them with water when I`m ironning them or iron with a lot of steam.Thanks for the fantastic idea! Great idea! It would make handling the fabric on the bias easier also. 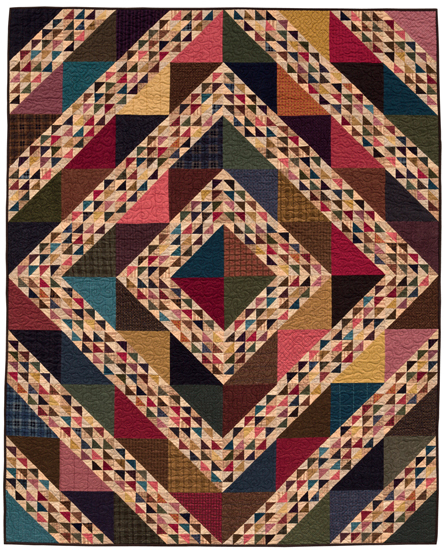 Thank you for all these suggestions and I am in love with your quilts!!! I’ve been using sizing, but not the handle. That will make a good thing even better! I’ve heard other people talk about sizing but haved never tried it. If Lisa does it – it has to be good!! Thanks! I never thought about sizing and your tip about the handle is great. I always have a hard time with the spray nozzles. I have been using sizing for years…now I have to get that handle. I usually used it to get out any wrinkles but now I will use it all over the fabric. Great tip!! What a wonderful tip! I’ll be doing this from now on! Thanks!!!! This post answers so many questions. I have to hurry here and go contact everyone in my cross country friendship quilt group. This will help us get more accurately sized blocks…important when swapping. That handle is going to help those of us with arthritis. Thank you so much and Merry Christmas! PS. I am loving all of your tips. This is the best tip I’ve gotten all year! Thank you!!!!!! You rock, I love these tips! I keep running into people shopping for your mentioned items! I tried the sizing as suggested in the directions for your “Back In Time” kit – worked great! Now I’ll have to find one of those spray handles for spray cans. Yikes, my wish list just keeps on growing and growing! Thank you so much, Lisa, for these fabulous posts! I am enjoying reading your great tips! :-). I love sizing, but I have been using it after I finish the block…NO MORE! I have some blocks to cut this afternoon…will be putting this one into practice! I am going to ask for the spray handle too, from Santa! Nifty idea on the spray handle! Thanks! Guess I’ll have to make a Home Depot run! I use Magic Sizing. New recipe – – 1oz. Vodka. Mix in. 8 oz. distilled water. Thanks for the tip Lisa – I avoid the hardware store – I become deer in the headlights, but will have to venture forth for this! Thanks for the tip on the handle. I love going to the hardware store! Thanks, too, for the reminder that too much steam will cause shrinkage. I actually use this tip and it does make a difference. But was not aware of using the handle for the spray can and I actually have one in my basement that I have never used. Thanks. I have some sizing and hadn’t had a chance to use it yet. Now, I”ll get a spray nozzle to use with it. I can’t wait to start something new. Now that is so clever! I have the can of Magic Sizing I found at the grocery store so now need to run to Lowe’s or Home Depot….thanks! Oh my goodness, that’s why my blocks shrink! 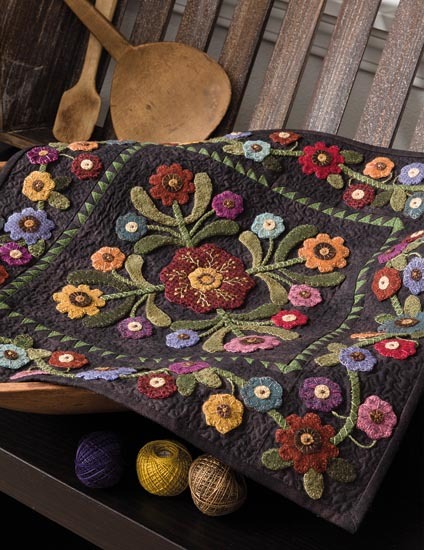 I love learning new things about quilting. Along with my Christmas shopping today I will be buying sizing and a handle for spraying. Thank you for expanding my quilting knowledge. and we learn another great idea! The strings on the back! I really hate that. Great tip! I have never seen the handle before, great idea. Thanks! Wow! Another great idea. I use sizing, but not like you explained it! I’m thinking this is one of the reasons my blocks usually end up small! I think you should give hints more often! I can’t wait until the holidays are over so I can put some of these ideas to the test! I have read about Magic Sizing on your website a few months ago and that is all I use now. Thank you so much for the very useful information for making our quilting lifes easier. well that is the best tip ever. I will have to look for that spray handle when I go to the paint section. thanks for the wonderful tip. I am going to have to try this! I have used Magic Sizing but never before cutting – that sure makes sense though. Thanks for another great tip! You had mentioned the sizing before and I purchased several cans. I LOVE IT! Mine does not have the cool spray handle. Where did you get that???? I really appreciate it when someone gives great tips that do not require a second mortgage on my house or a special item that you only use once. I prefer spending my extra dollars on new projects or new fabric. You ROCK! I am going to try this. I have tried spray starch after I have cut the pieces, but not before. I am going to try Magic Sizing too. Does it put a residue on the iron? I have never seen this tool before – thinking hardware store after work. Wow I will be trying this for sure. Magic Sizing is awesome….the price is right too!!!! Never used sizing. I must try it now. Best tip so far!! Best tip yet! I’ve just had a huge AHA moment! I always have trouble with my blocks coming out a bit too small, and try as I might to sew a scant 1/4″ seam, I still have problems. I always use steam when I iron. Thanks SO MUCH for this tip! Great tip! Now I know why my blocks are ALWAYS smaller! Thanks for sharing another great piece of information. I am getting one if those sprayers! Hi, I read this tip on your web sight a couple of years ago and have used the sizing. Did not know about the handle; sounds great. told my husband about the remodeling and he actually said we’ll have to road trip!! I’ve never used spray sizing! I’ll have to get some! Thank you so much for this tip! I will have to give it a try. Thanks for sharing! Love the idea of using the spray handle idea! Thanks — Michelle S.
I’ve used the Magic sizing for applique, but not for the “pre-cutting”, Will have to give it a try. No strings would be nice also. Who knew about the spray handle? Thanks for the great tips!! I never thought to use spray can handles for anything other than spray paint. Clever, I will definitely do it now. THANK YOU!!!!! I was delighted to have an explanation for what happens to my pieces, plus the added info about less threads hanging! YIPEE, I’m in the know now! I use this and love it. Now I need to find the spray handle and I will be set. Thanks for all the tips! Love the spray paint handle! Another great idea–you have referenced spray sizing before, but I never knew what this was. Thanks again. I’ve learned so much in these last few days! I’ve not tried this, but I’m thinking I should. Love the spray handle tip. I have problems with my small projects, and your post makes me sense. I’m anxious to try it out. Thank you! I love Magic Sizing which I discovered when I was sewing my children’s clothes. These children are now in their 40’s. I just went from using Magic Sizing on clothes to quilting and you are right that it does wonders! Great idea about adding the spray nozzle.I will ask Santa for one. So that explains my block frustration! Thank you, Lisa, for this tip and the information about steam and shrinkage. Love the Magic Sizing. Have that. Wow. This is my favorite so far. I love sizing but haven”t used it too much and I love love the handle! This is really going to help me get my blocks the right size! What a great idea – just one of the many you have. I have get this right away. Thanks! Oh my! This is something I’ve never tried or heard of. My blocks really shrink so maybe this would work! When the student is ready, the teacher will appear…look at all we are all learning from you. Thank you! While retreating with you, you taught us about Magic Sizing and now all we need to do is get the neat tool. Thanks for the reminder on using sizing, Lisa. Sometimes I get so anxious to being a project, I forget the basics. Thanks, Lisa for another great idea. I have used the sizing for years but the handle idea is wow! I’ve used sizing to finish my blocks, but never at the pre-cut stage……gotta give this a try. Thanks Lisa! I love sizing and have used it for years but I never thought of the spray attachment. Great idea. Thanks for sharing all these wonderful products, what a great gift to us. Now, that is a wonderful hint !!!! I will try it…..hope to win anything !!!! I am learning so much from these days. I will need to try this too. I use Ellen’s pressing liquid. Will have to ck out the SIZE. Anything for more accurate piecing. I’ll give it a try. Thanks for sharing. This sounds like magic! Thanks for sharing! ps LOVE that sign in the background. I too use the sizing, the handle is now a must, thanks. Wish I had an investment in the spray handle…..never heard of one…but will be looking now. Thankss! Well Duh! I do not wash my fabrics either, but it never dawned on me that they would shrink while pressing a completed block. Thanks for the great tip! I have used Magic Sizing for years but never had a handle..I need to get one now!!! I still wash fabrics…too many past disasters! But I do use sizing when I press the fabric and that handle is a great idea! I used to use Magic all the time when I ironed my blouses, etc….back in the old old days! Would never have thought of the handle thing…great idea! My blocks always turn out small; I hope Magic will prove to be true!! Thanks for thisGREAT tip…I think you’ve solved my problems!